First, you’ll need to install a few libraries to get things running. Luckily, unlike Torch or OpenCV, they’re really pretty easy to install using package managers like pip. You’ll also need the scripts used in this tutorial, available here. To train your Word2Vec model, you’ll need some plain text input for it to learn from. Larger files, like a Wikipedia dump*, will produce a more robust model but will take way, way longer to train and reduce. A good place to start would be a novel downloaded from Internet Archive. Keep in mind that misspellings get learned too, so a “clean” file can make a big difference. Also important to think about (though sadly out of the scope here) is that any bias present in your source text will get baked into your Word2Vec model as well. Gender relationships, connections between ideas – Word2Vec captures these from its input the same as any other connections between words. TLDR: it’s worth picking your ap psychology review carefully, and important not to think of a machine learning model as a pure representation of language. You can put your source text anywhere, though I keep mine in the ModelsAndData/ folder to keep everything organized, and these scripts will save there too. * If you do use Wikipedia, you’ll want to strip the wiki tags from the text. There are a few ways to do it, but I suggest Wikipedia Extractor, which is very reliable and makes it really easy. Why reinvent the wheel, right? While this won’t be an issue for most projects, you may want finer-grained modeling of language, especially with words that are spelled the same but have different meanings (homonyms). For example, the word “box” can be an object (noun) or an action (verb). To preserve these differences, we can tag the words with their parts-of-speech. When training, box_NN will be seen as a separate entity from box_VB . We can add POS with the help of the pattern library, which does all the heavy lifting, and TagTextForTraining.py which wraps it up and outputs a text file for training. Open the script and modify it to include your input text file and a new filename to save. Run it in the Terminal – this could take quite a long time, depending on the size of the input. The script will build a vocabulary from the text file, train the model, and save it. This can take between 30 seconds and a few hours, depending on your source file and your computer. The resulting vector space can be hundreds or thousands of dimensions – very detailed but impossible to visualize. Luckily, the tsne (t-distributed stochastic neighbor embedding) algorithm lets us efficiently reduce the vector space while preserving, as much as possible, local spatial relationships between words. It’s way out of the scope here to discuss how tsne works, so let’s call it magic, or you can read way more about it from its creator Laurens van der Maaten. The reduction is done with the TwoStageReduce.py script – open it like before and modify the variables as needed. When ready, run your script! This will take the longest of any step – I’ve had it take up to several hours. First it will load your model, then reduce the vocabulary as specified, do an initial reduction, a final reduction, and normalize the vectors to a range of -1 to 1. It will save each of these variations as csv files, making them easy to use for visualizations, etc. Optionally, you may want to convert your vector space into a nice, even grid. This can be helpful for visualizing data that is clumped together, or for things like searching. The TsneToGrid.py script uses the rasterfairy module (installed in the lib/ folder, since it can’t be installed with pip). Change the input/output files and run it. The script will print the output dimensions of the grid (such as 25×26 words) which you’ll want to note if you’re doing any kind of visualization or interactive project. 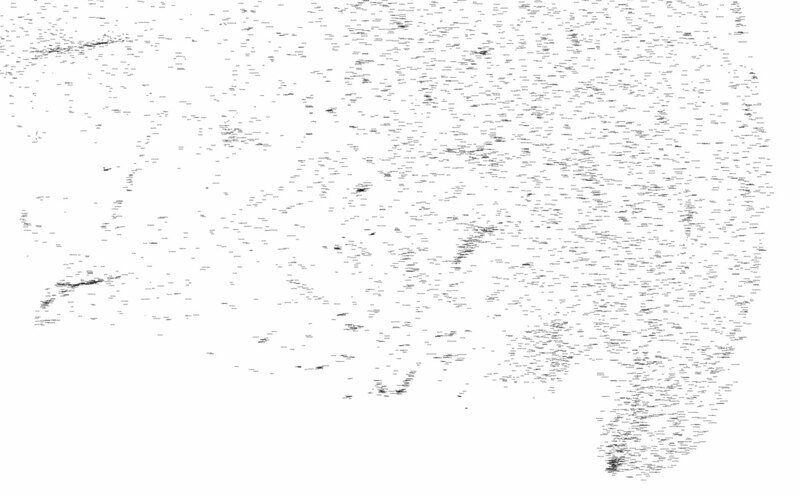 Data is hard to read, so visualizing the vector space can be really helpful. The included Processing script will load your 2D csv file and output a png file, showing the characteristic tsne blobs and tails (or a grid, if you changed it in the previous step). Open the sketch, change the input and output filenames, and any other settings you want to change. 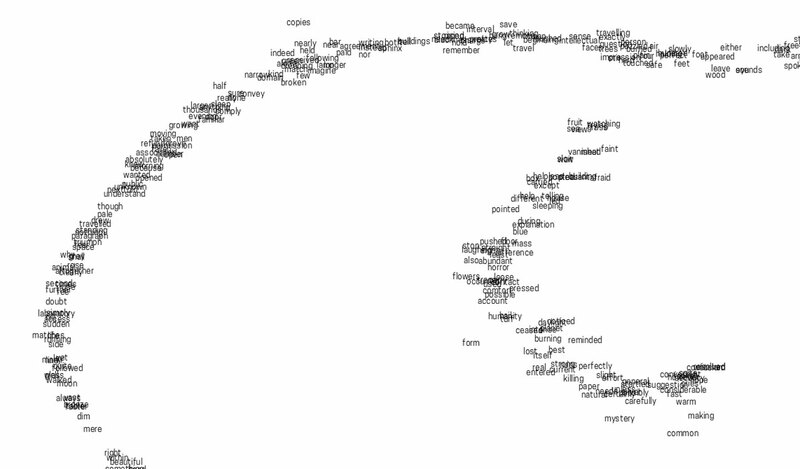 Above: detail of Word2Vec space, trained on H.G. Well’s “Time Machine”. Above: detail of the same space, converted to a grid with rasterfairy. That’s it, go make something cool!